In this new 60-minute, high-quality waitstaff training video, your staff will learn how to consistently deliver the quality service that makes customers not only come back, but tell others about their memorable experience. 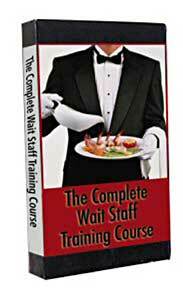 This training video is ideal as a backbone in your training program for experienced waitstaff who are always looking to learn more or for people who have never waited tables and would like to learn the basics. In this new 60-minute, high-quality waitstaff training video, your staff will learn how to consistently deliver the quality service that makes customers not only come back, but tell others about their memorable experience. This training video is ideal as a backbone in your training program for experienced waitstaff who are always looking to learn more or for people who have never waited tables and would like to learn the basics. This video is highly recommended for training new employees who have never waited before. The training video is on-site and available when needed so you can immediately train new staff and update existing staff right away! A study guide and tests are included. A printed, 26-page study guide is included in the package with information and test questions. The guide is in Spanish with the Spanish version of the video. A certificate of completion is available. Click on the clip images below to view samples from the video. Please note that the quality of the samples is reduced from the original for internet transmission.